Yes, I have finally broken away from my burgundy and black obsession! Stripes always go with red, in my opinion, and I think the camel breaks it up nicely and keeps it from veering too much into sailor territory. Originally I was going to throw on my faux fur vest but found myself reaching for this statement necklace instead, and I like how it turned out! 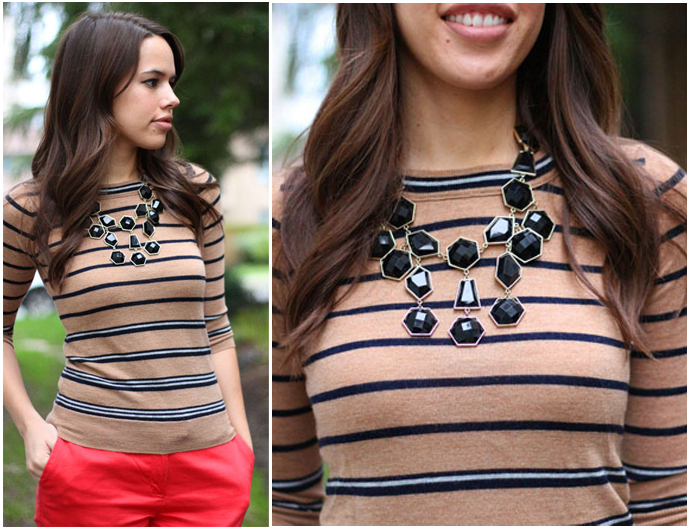 love the fancier necklace with the traditional stripe sweater. Love this look! So easy to put together, chic yet looking very comfortable too :) Those pants are amazing! I love the variation of stripes in your sweater. Love the camel & red together.